My 2017 has started with roadtrips. I know...for an ardent traveller like me who rarely goes on roadtrips, this is quite a change. Who's complaining though. If I can't fly to far off destinations (which seems to be distant this year thanks to serious investments) I can take the road anytime I want! 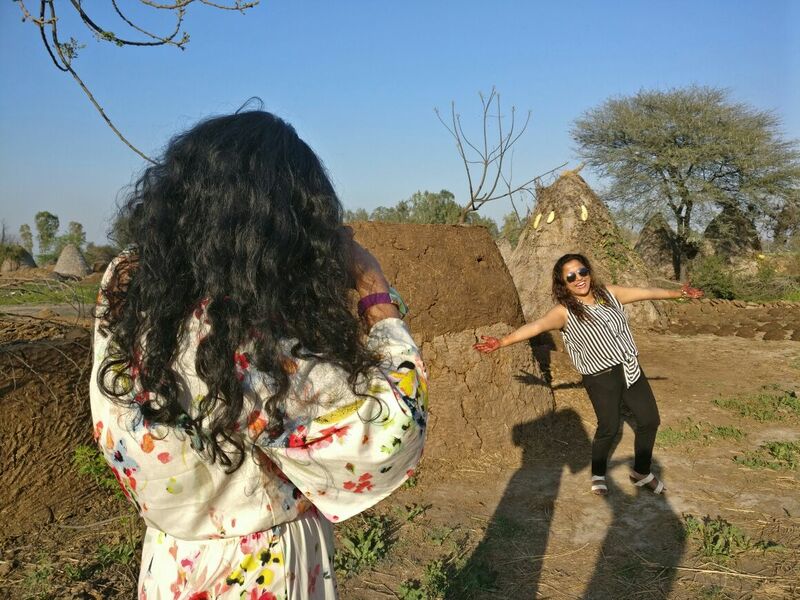 After a road trip to Vrindavan last month, I was once again on the highway; driving through the state of Haryana. It all started with my batchmate's wedding. It was in Kaithal, a town in Haryana near Ambala. I am mentioning Ambala as its the most prominent city near Kaithal. In India, a wedding is a silly cause to reunite with friends and travel. Therefore I planned with other friends of mine (batchmates of course) to turn this wedding of our dear friend into a weekend extravaganza. We started at around 12 noon and hoped to reach by the evening. The trip started with a bang. We stocked up on chips, cold drinks and other knick knacks that are great accompaniments for the road. We also had a delicious cake with us as it was our friend Nishant's birthday. But that was ought to be an surprise.We started from Hari Nagar, Delhi and took the GT Karnal Road. It took quite a while to cross Delhi as the traffic was crazy; even on a Saturday. As we exited Delhi, the road became clearer. Our Toyota Etios Cross zoomed across the National Highway 1. Few things to be kept in mind while on a road trip. The car should be checked properly so that there is least possibility of breaking down while on the go. You may never know how the road would be and whether services would be available. Tyres should be checked for proper air pressure. My husband prefers to keep air pressure of the tyres a bit on the lower side on a long drive. The Stepney should be checked for air pressure. It should be fully functioning. Ceat makes great tyres and I feel that Ceat Tyres are best for long drives. Always fasten your seat belt when driving. This applies for everyone in the car and not only the driver. Don't drink and drive. Never ever mix alcohol with driving even in the minutest quantities. Its unsafe not only for you and the people inside the car but also for all the other people on the road. Always overtake from the right side. Its actually a nuisance driving on the roads of Delhi when no one believes in lane driving. But once you step out on the Highway, these rules are imperative. Lane driving is sane driving. Last but not the least, always obey traffic rules! Kaithal is around 200 km from Delhi. The roads are wide and nice, promising a nice drive. That means it would have been a journey of around four hours. However when crazy people like us are in the car, the journey can last for an indefinite time! 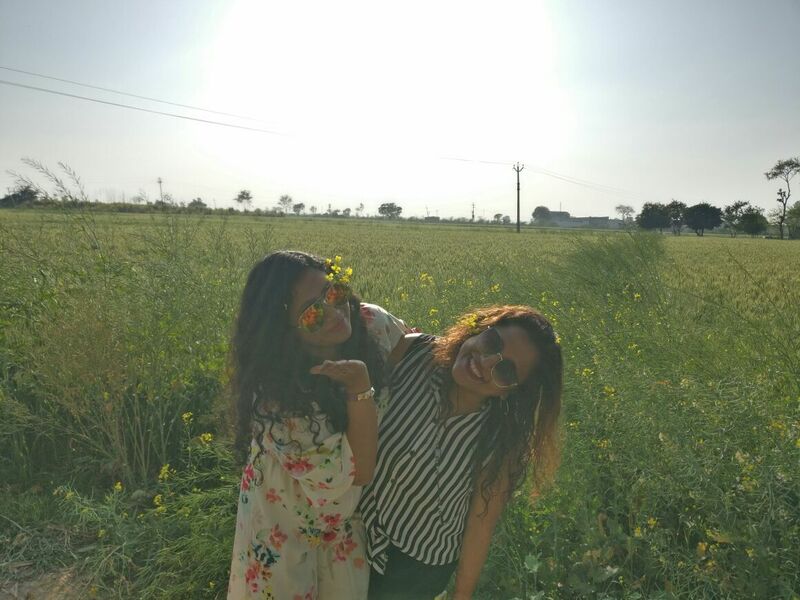 We took so many pit stops on the way that at one point we started thinking whether we have to attend the wedding in the casual outfits we were already donning. After driving on the NH 1 for about a couple of hours, we took the National Highway 44 which led to Ambala. I and my friend Srita were looking out for a beautiful location for the cake cutting ceremony. After a while, we found a small strip of land with rows of trees overlooking a canal. We decided to look no more and stop the car. While I and Srita lit candles, Srita's husband kept Nishant away so that we could surprise him. Srita borrowed matches from a sugarcane juice seller nearby. And then by the waterfront in midst of nowhere we shrieked Happy Birthday! It was a surreal feeling! After smearing cakes on the birthday boy and gobbling it to our heart's content along with other beverages and snacks, we roamed around for a while. We took crazy pictures on the streets much to the amusement of the villagers. Our next stop was a wheat field. We have been mesmerised by the vast lush green wheat fields on both the sides throughout the drive. 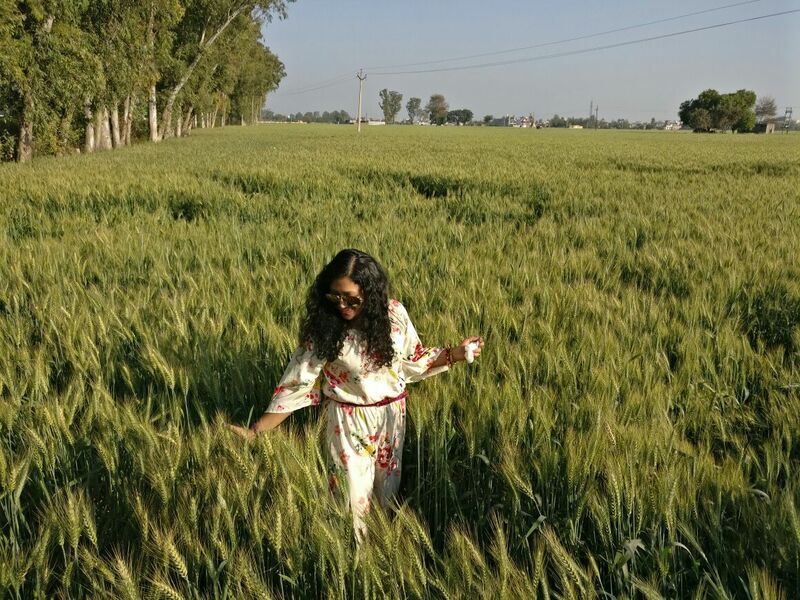 There was a point where we found parking space and there were both wheat and mustard fields. We did not waste time in deciding and immediately pulled off the car. Our third stop was rather strange. It was my wish actually. 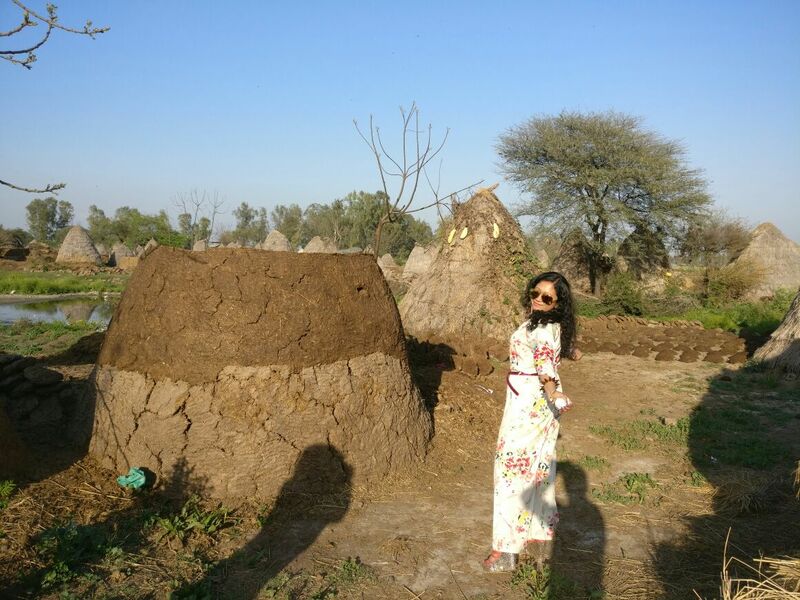 The straw huts and the cow dung cakes enticed me for an editorial shoot. What followed thereafter was utter craziness. Somehow there was so much freshness in the air filled with cow dung reek. Finally we decided that we won't stop anymore. 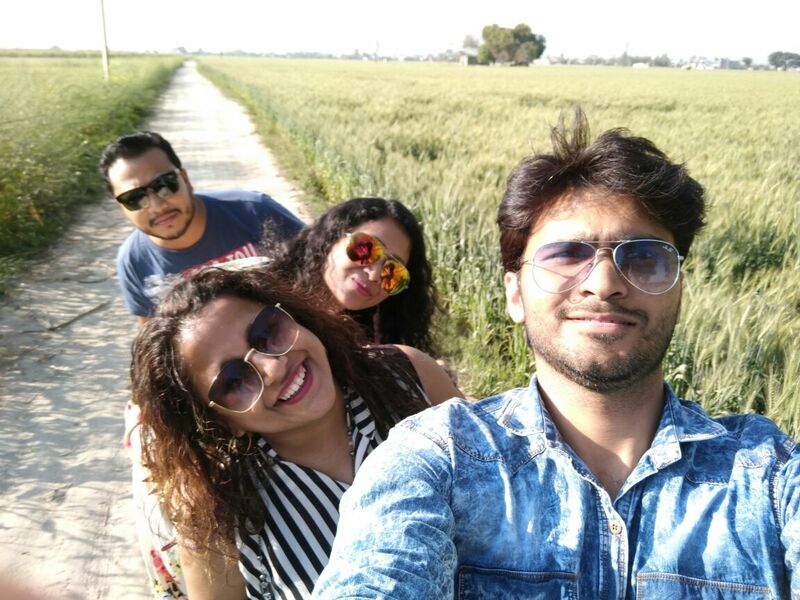 We blindly followed the GPS and headed straight towards the wedding venue in Kaithal. We completed the 4 hour journey in 6 hours! But what we had is an epic road trip. We had woven unforgettable memories! A road trip is never about the destination but always about the journey! There is fun in being close to nature and traveling to small town. Next time, do some shopping in Ambala and eat street food. I love the fact that you travel so much...n i m particularly in love with this floral jumpsuit of urs. If you need to get your visa for Vietnam, you desire a good visa service. And that good visa service is the https://greenvisa.io visa service. I offer you my word they'll provide you with your visa. You must follow Maid of the Mist with Journey Behind the Falls,Zoom Tours Niagara must let you there with them. You can get and discover what the inn brings to the table as far as spas, eateries, pools and other diversion offices. Web is a decent method for watching that as well.